A year or two ago I was asked to contribute to a Walt Disney World guide book. The one piece I ended up writing–about the Magic Kingdom's Splash Mountain–was as far as I know never included in the book. I always liked what I wrote, especially it's conclusion, so I thought I'd share it here. My own feelings about Splash Mountain are somewhat muted. Waiting in line for the ride can be a tortuous experience (save for the beautiful subterranean queue in Tokyo's version), and the ride seems very reliant on a story that I suspect is incomprehensible to most guests. But it is fun, andthe final paragraph in my summary indicates that I think it demonstrates some truly noteworthy design. Let me know if you spot any inaccuracies! Splash Mountain, along with attractions like Tower of Terror, continues the trend of incorporating thrills into the Disney parks by wrapping traditional amusement rides in elaborately-themed packages.Imagineer Tony Baxter–famous for designing Big Thunder Mountain–is said to have come up with the concept while trying to figure out what to do with the dozens of animatronic animals orphaned at the closing of Disneyland's "America Sings" show. The solution, an update to the standard "log flume" ride, opened in 1989 at Disneyland and became an instant hit. It wasn't long after that a second-generation version of the ride was prepared for Walt Disney World and Tokyo Disneyland. The Magic Kingdom's Splash Mountain (opened three years later) is similar to the original but sports enhancements that make the overall experience more pleasant. The flume itself is a foot wider in Orlando, allowing larger capacity boats where guests sit side-by-side rather than single-file. It's not only a more comfortable arrangement but one that's faster to enter and exit, increasing the ride's capacity. The flume technology itself–this time designed by Disney rather than the off-the-shelf technology used in California–makes the ride considerably smoother as well. The logistics of constructing something as large–and unusual–as Splash Mountain are worth examining. The ride's exterior was first sculpted in miniature, then scanned into a computer. Wired to a rebar-bending machine, the computer produced life-size section-by-section replicas of the model. After installation of each section on-site, concrete was sprayed, then shaped and painted by craftspeople to appear like the clay and dirt that supposedly make up the mountain. Scale and color were both taken into account to ensure that the structure, intended to look like southern clay, coordinated with the western feel of neighboring Big Thunder Mountain.Making room on the site itself for such an enormous ride (remember: there's a huge warehouse behind Splash Mountain that holds most of the attraction) wasn't easy, either. Frontierland's old train station was in the way and was demolished, replaced with the elevated station now nestled in-between Splash Mountain and Big Thunder. 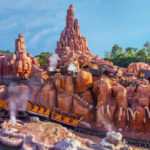 The Disney parks have an intense and loyal fan base, and few changes to the parks get made without associated controversy.Purists endlessly debate whether a ride like Splash Mountain that features Disney characters belongs outside of Fantasyland, or the appropriateness of an attraction themed to the old South in a land that's supposed to depict the frontier West. (Or, indeed, whether thrill rides belong in a Disney park at all!) Regardless, the ride's cute animals, exciting plunges–not to mention its air-conditioned interior–have made it a bona fide hit. Splash Mountainbroke a long-standing taboo: for the first time Disney guests would, by design, get wet.Since then, the floodgates have literally been opened to guests being sprayed on Aladdin's Magic Carpets and drenched on Kali River Rapids.The success of Splash Mountain hasn't gone unnoticed elsewhere in the amusement ride industry, and themed water rides have become more and more common. 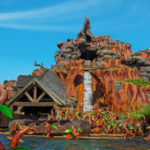 Alton Towers' famous flume recently got a "bathtub" overlay, and one needs only travel a few miles to Universal Studios' Islands of Adventure to see no less than three Splash Mountain-inspired water rides, including the Jurassic Park River Adventure. 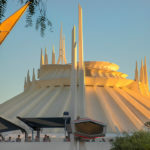 If you're on the attraction at sunset, be sure to note the absolutely spectacular view of Cinderella Castle and Space Mountain as you ride over the crest of the mountain. 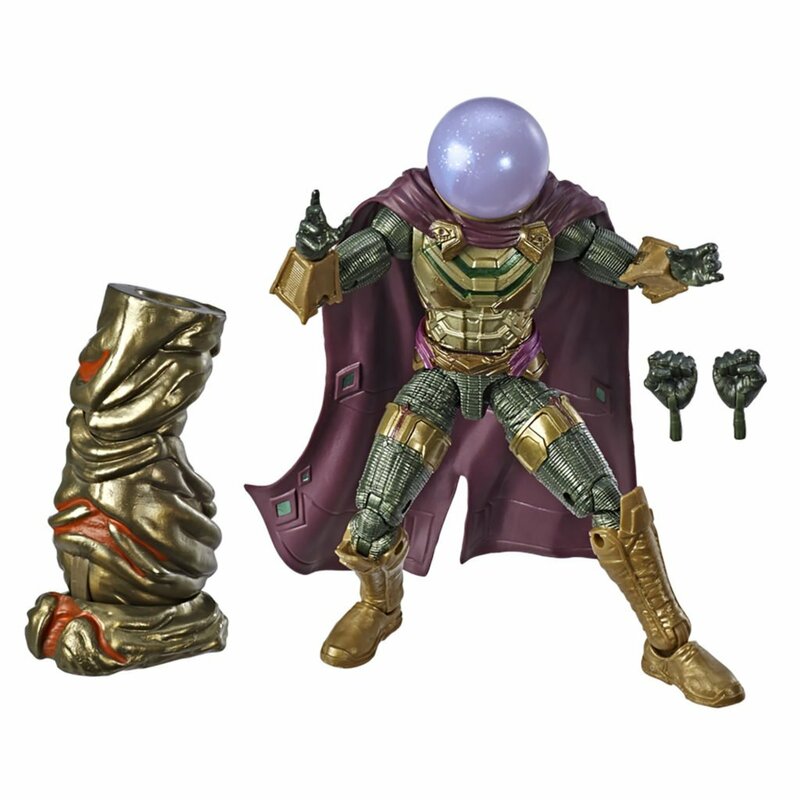 Seeing it unfold, you'll first think to yourself, "beautiful!" Soon after, you'll realize that the postcard-perfect view probably wasn't an accident. 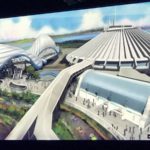 And not long after that, you'll begin to appreciate the forethought that has gone into making the Disney parks the experience that they are.